Want to form a habit of budgeting your finances? 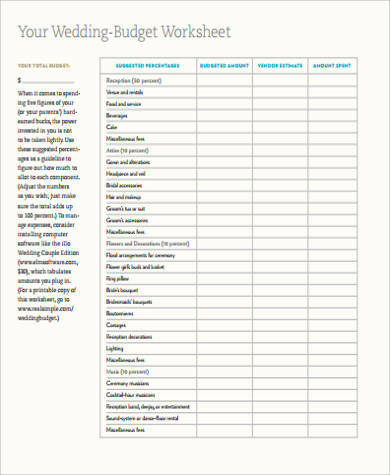 We have Printable Worksheet Samples that are effective tools to help you organize and document matters about money. 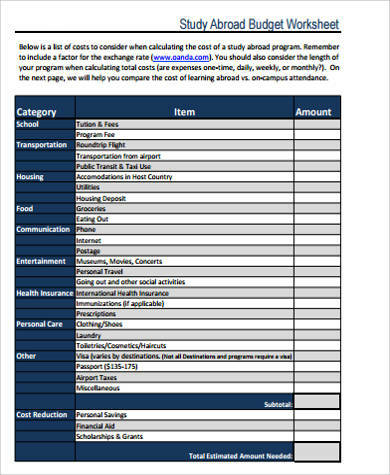 They are pre-formatted so filling them out will be very convenient. Tracking your money helps you get a better understanding of how it comes and goes. Following a budget plan can also eliminate the possibility of being indebted to someone or help you work out your existing debts. 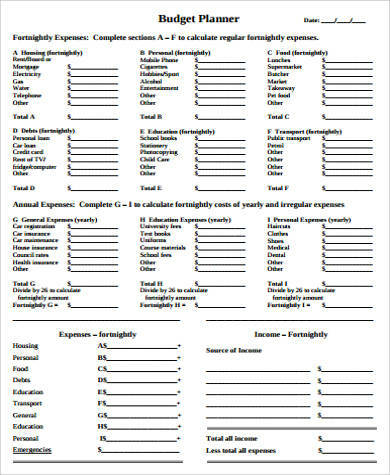 Templates dedicated to documenting your finances will help you evaluate how much to allocate for specific expenses. 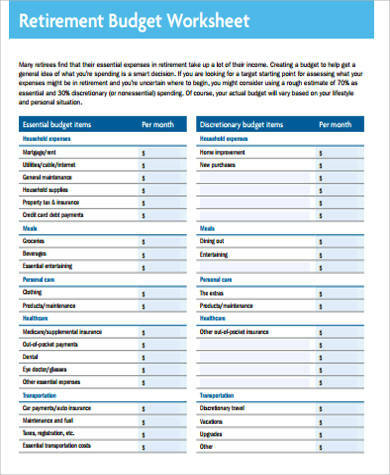 These sample budget worksheets are in PDF format. They are readily available for download and printing. A budget is simply an itemized listing of your expenses and income for a given period of time. It may be daily, weekly, monthly, quarterly, or yearly. Budgeting your finances is beneficial in a lot of ways. It helps you put your priorities for spending in check so you do not spend your money on wasteful resources. 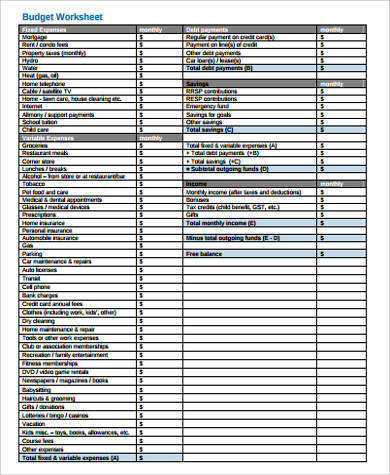 It can help you analyze which ones of your expenses are considered wasteful or needs necessary adjustments. It helps you figure out a long-term financial goal such as investments and savings. It prepares you for emergencies that need an extra financial push. It gives you peace of mind because you can track down whether you have extra cash or if you are running low on it. Figuring out how to make your income and expenditures meet may seem like a tedious process, but it is proven to be beneficial in the long run. 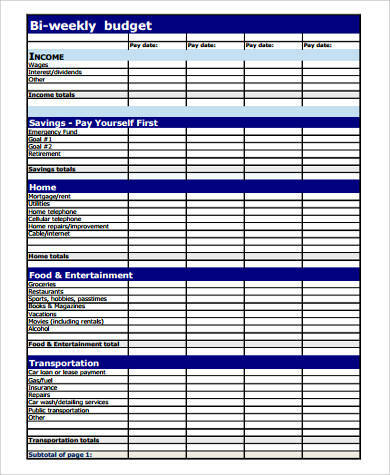 Making the budget worksheet for your finances is not complicated with Printable Budget Worksheet Samples available. It has a format that is well-designed for your convenience when it comes to money matters. 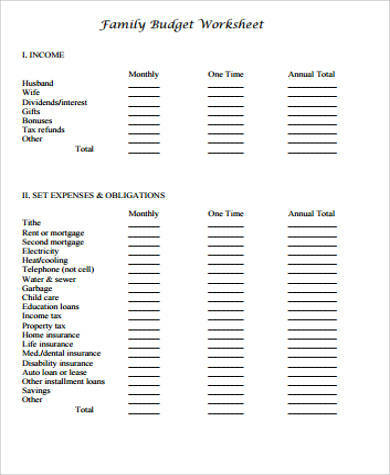 All you need to do is print the worksheet, fill out the necessary fields, and you are on your way to a stress-free method of balancing your money. Need help with planning your family finances? 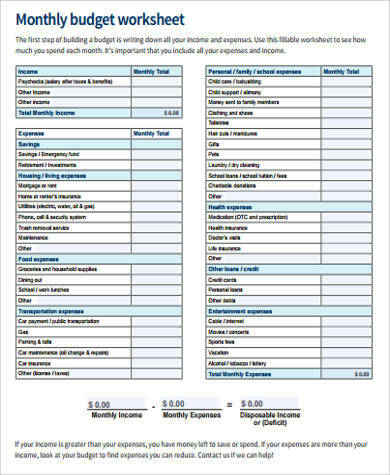 You can check out our Family Budget Worksheets. 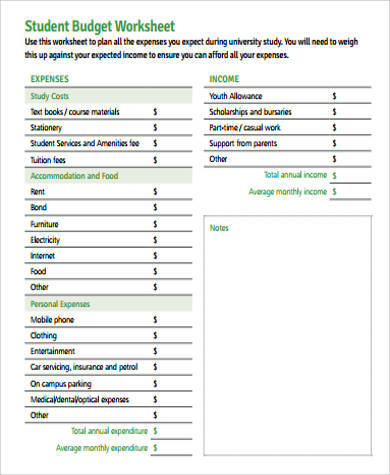 Creating a budget helps you out when it comes to paying what’s necessary first such as utility bills and groceries. It can even help you set aside some extra cash for that dream vacation or dream car you have always wanted. The most difficult part about having a budget is not the actual creation of the budget itself. It is the part where you have to stick to your budget plan. 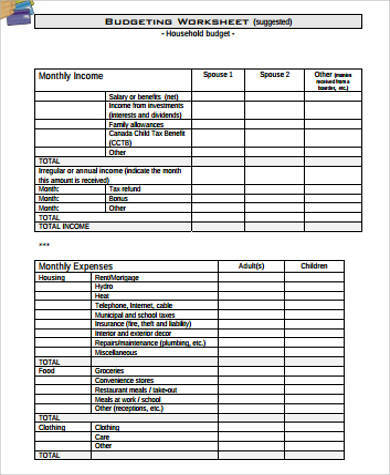 This is the aim of the budget worksheets available on our website. It helps you make a realistic budget for your short-term goals and make them achievable. This, in turn, will eventually make achieving of long-term financial goals easy as pie. The word budget is often associated with multiple restrictions that come with it. There is no denying that restrictions are a part of having to create an efficient budget. But a reward system can be established whenever you are able to achieve the goals that you have set with your allocated budget. 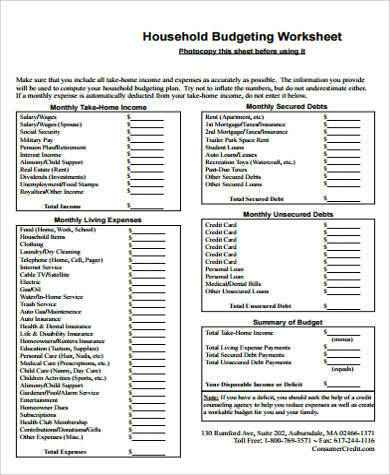 You can check out our Sample Home Budget Worksheets for more insight on how to manage your money wisely.